Happy Spring! Spring is in the air and now that the cold winter is over, we want to be out and about in minimal clothing, at least I do! Two important factors in looking good in warmer weather is your skin and your body. So it makes sense that everyone is thinking about skincare and fitness. Over the winter I tested two products to see if they worked and share them with you. I wanted to use them most of the winter in order to prove that they work, and for me they did. So here is my opinion on a couple cool products that are getting me ready for beach and bikini season. For skincare, I've been using products from Juice Beauty and I am pretty impressed! For one, they are a 98% organic skincare line and they do not test on animals. Also, it looks like pretty much everything they offer is vegan-friendly, or at least the stuff that they sent to me. I'm loving their Cleansing Milk and am almost done with the bottle. I use this as a cleanser and also as a makeup remover. It removes better than any other makeup remover I've used before and is tough on eye makeup but gentle on your skin. Other oil-based removers have made my skin breakout in the past, but after using this vegan cleansing milk this winter, my skin has stayed hydrated and clear. I also used my samples of their serums (I love their Soothing Serum), cleansers, and moisturizers and love them! So if you are looking for gorgeous glowing skin this spring, Juice Beauty just might be for you. For fitness, I have been using a workout DVD from Collage Video. They offer a HUGE variety of workout videos that can satisfy anyone's fitness needs, no matter what your taste or fitness level is. 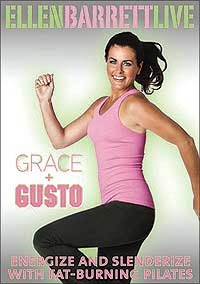 The workout I've been hooked on is Ellen Barrett's Live, Grace & Gusto. And what this workout is, is pilates and ballet with a little bit of yoga. In my opinion, this is the perfect workout to achieve a toned and lean figure, along with your vegan diet. In fact, my body has responded so well to this workout and I have not changed anything in my Dirty Vegan diet and lifestyle. I have been doing this workout consistently for about one month (I wanted to be sure I tried it in order to give you guys an accurate review), and I have seen changes in my weight (small loss of a few lbs - but I would probably see more if I replaced my cookies with salads, not happening! ), in the way my clothing fits, and in the way my body looks. I feel great and look toned and leaner. I love ballet, pilates, and yoga; this workout is perfect for me for this reason! It is also important to do something you truly enjoy, or else you might not stick with it. So be sure to check out collagevideo.com because they really do have everything when it comes to fitness. The prices are awesome too. I plan on doing an update sometime this summer because I plan on stepping up my game with this workout and will let you know if I see any more results, maybe even a before and after picture, we will see. Here is a video clip of this workout so you can get an idea of the exercises and energy. I really like Ellen Barrett because she is not annoying, which is also another important thing to me in a workout DVD. What are you doing to prepare for the upcoming skin-baring seasons? Have any good tips? And for now, the Dirty Vegan is signing off. Namaste.